WE ARE OFF and running with that satisfying victory at Newcastle, but the scent of the Danny Rose controversy has only been swept under the Wembley carpet. It will keep coming back like a bad smell. His appallingly timed barrage attack on the Tottenham wage structure is certain to rear its ugly head again before the new season is much older, because there are at least six supreme Spurs players who know they could get double their wages at other wealthy clubs. For most of us mere mortals, earning �65,000 a week is a dream beyond avarice, but Rose and several of his team-mates have been convinced by their agents that at least twice that awaits them in a crazed football world where galloping greed is the new drug. It is obscene what footballers are being paid at the top level. with �100k-plus wages the norm. To be honest, you cannot blame these young men wanting to get their hands on the astounding riches. I know if they were my sons I would advise them to grab it while they can. As I pointed out in my last blog, PSG are paying Neymar more in one week than Jimmy Greaves earned in nine years with Spurs. I wonder just how long the footballing public will put up with the money madness before revolting and refusing to pay the sky-high ticket money? Meantime, let�s enjoy the purist football that Spurs are promising to serve up again this season. Some of their passing in the second-half against Newcastle could have been set to music. Sky made Kyle Walker-Peters the Man of the Match. and while the young right-back had an exceptional game I thought the award should have gone to Christian Eriksen, who was immaculate with his movement and imaginative with his passing. Now if we are going to have to pay silly money, there�s a player worth more than �100k a week. Our guru Paul Smith was at Newcastle, of course, and gives his eyewitness account HERE. I think �Mr Odyssey� can look forward to reporting on a strengthened Spurs team very soon. I have been consistent in saying that Spurs remain interested in Ross Barkley and there are another two players on their radar, with the end of the transfer window approaching quickly. We have suffered too much pain against Chelsea in recent years to take anything for granted as Tottenham prepare to face the League champions in their Premier League debut at Wembley next Sunday. 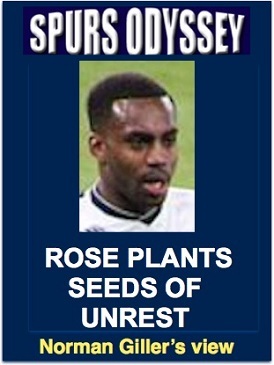 Hopefully Spurs will come up smelling of Roses. 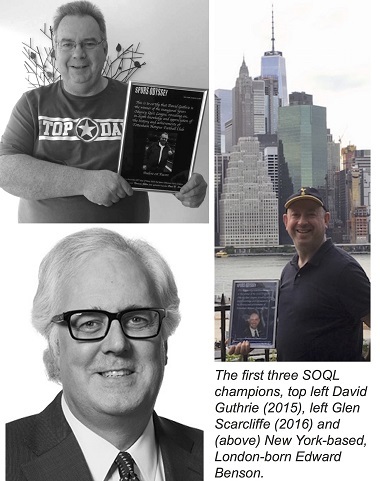 SO HERE WE GO AGAIN � The fourth season of the Spurs Odyssey Quiz League title race. The rules are simple: I ask one Tottenham-related question for which a right answer earns you two points, and then a related teaser that can bring you an extra point. The winner this season will again get a framed certificate, plus a no-longer-in-print autographed GOALS book by Spurs idol Jimmy Greaves and another collectors� item from my Greavsie collection: Football�s Greatest Entertainers, signed by Jimmy and Tottenham�s Mr Loyalty, Steve Perryman. I make no apology for dipping back into the past for my heroes. Jimmy and Steve remain top in my personal Tottenham hall of fame, and I am sure many of you out there agree with me. Harry, Dele and Co will no doubt be up there with them one day. Who won 22 international caps, skippered an FA Cup winning Tottenham team and managed a League title-winning club? What number shirt was he wearing when he collected the FA Cup from the Duke of Kent? That�s when I fall out with good friends. In the final count I am the sole judge, and you just have to accept that I am right. Yes, I am out of the Donald Trump school of arrogance. Last week�s teaser was: Which Watford-born player followed his Dad as a professional footballer, won four England caps, and played in a winning League Cup final team with Tottenham against the club he later joined? Yes, it was goalkeeper Ian Walker, who followed his Dad Mike Walker into football and gave Spurs sound service before moving on to Leicester. One thing he will be remembered for was kick-starting the WAG culture! First name drawn from the correct answers was Iain Fox, of Wealdstone, who has followed Spurs since his schooldays in the 1960s. I will send Iain a screen version of my Spurs �67 book (you might consider buying a signed hardback copy from me at http://www.normangillerbooks.com � all profits to the Tottenham Tribute Trust to help our old heroes).